Recently the KnightLight Theater in Jefferson Texas opened the doors once again for something different. 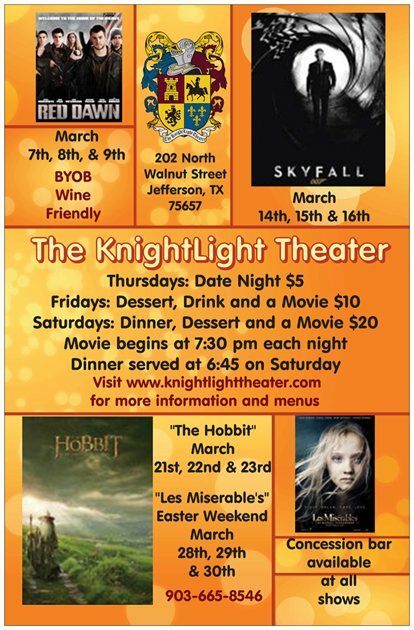 In March they will be showing movies and dinner for an all-inclusive price. This development is really an attraction like none other in town. One of the best things about this new venture is that you may BYOB and enjoy a movie night out with family and friends in the comfort of a lovely theater without going very far. We highly recommend that you call them at 903-665-8546 to reserve your seat for the show, we have a feeling this is going to become very popular very quickly.